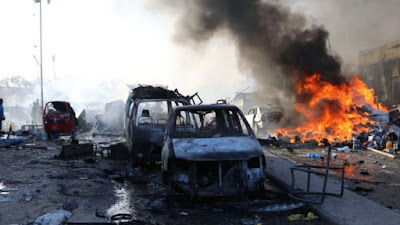 Trucks and tankers will be banned from entering Mogadishu during the day in the wake of two deadly attacks on the Somali capital in just two weeks. It is hoped the ban will improve security at a time when the effectiveness of its current measures is under the spotlight. Two top security officials were fired following the most recent attack on 28 October which left at least 27 dead. Another attack two weeks earlier killed more than 350 people. The 14 October attack - the deadliest in Somalia's history - was carried out using a truck packed with explosives. The capital's mayor, Thabit Abdi, announced that trucks and tankers cannot pass through the city from 07:00-20:00. Those flouting the ban risk a fine of $1,000 (£750). The Somali government blames militant Islamic group al-Shabab for the 14 October bombing, which took place at a busy junction.